Hi everyone! Well, I suppose it’s clear that I’ve been a little distracted from the blog since the beginning of the year… my apologies! As you know, my boyfriend and I got engaged over the holidays, and it’s been quite the whirlwind trying to get the wedding all planned. Add some significant hand surgery (long story - involves falling on a cactus! I’m doing great now! ), and things have just been a little nuts. Since the moment we were engaged, I’ve been excited about having engagement (and wedding!) photos done by Whitney. She is the owner and head photographer extraordinaire of Whitney Lee Photography here in Austin, TX, and she’s also officially becoming my family. You see, she is the lovely mother of my fantastic soon-to-be stepson. My fiance and I wanted something a little different, a little more “editorial” for our engagement pictures, so we decided to go with a Mad Men-inspired theme. The lovely folks at the Highball graciously let us shoot at their fabulous venue, and we got all dolled up 60’s style for the photos. Whitney was absolutely amazing, taking two people who have a proven history of being ridiculously unphotogenic and creating these gorgeous works of art. I hope you enjoy them - we certainly do! You can check out all of Whitney and her team’s work at www.whitneyleephotography.com. Take care! Last night, my fiance and I celebrated the marriage of our dear friends Ben and Leah at the lovely Hamilton Twelve outside of Austin. After a beautiful ceremony, we enjoyed the amazing Austin weather at the outdoor reception and danced the night away with friends and family. Ben and Leah asked me to create their wedding cake(s) a while back, and it was such a pleasure and honor to design something special for them. 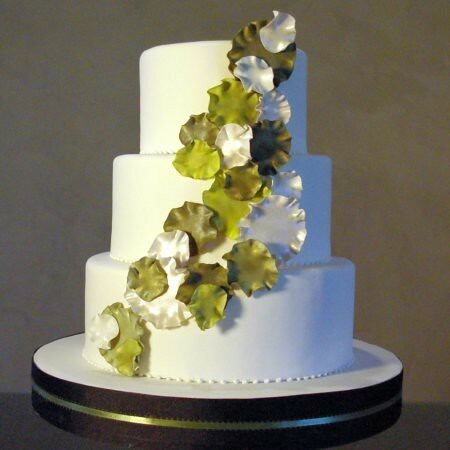 Rather than the classic bride and groom cake combination, the couple wanted to have multiple coordinated cakes that were each unique in design. 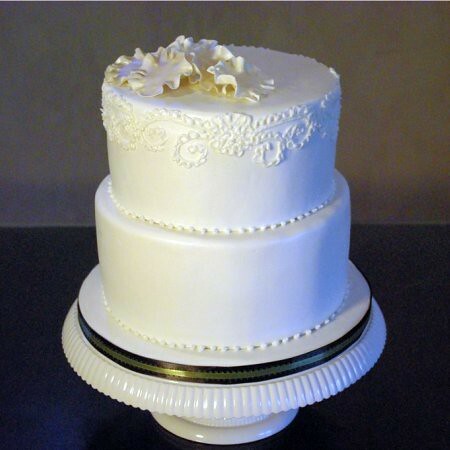 I created three cakes, including one that was inspired by the lace pattern in the bride’s dress. 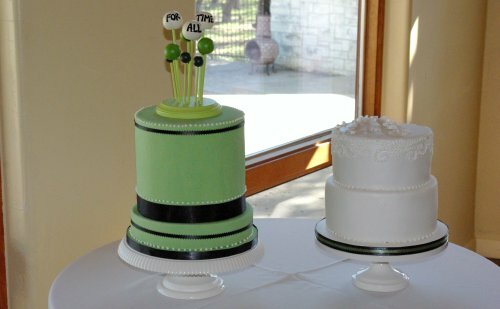 The topper on the green cake was actually designed and created by the groom! The cakes were split between our Lemon-Raspberry Dream and Southern Red Velvet flavors. This 40th birthday cake is a “double barrel” cake, which is basically two 8″ round tiers stacked and iced to look like one super-high tier. Happy 40th! I’ll have several more designs to share before the holiday break… stay tuned! 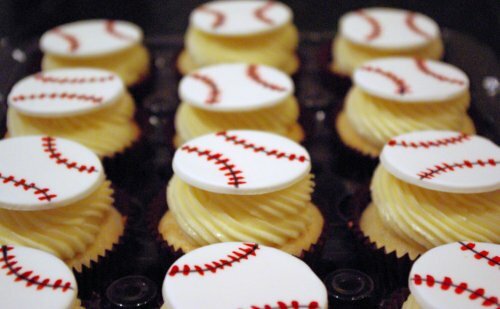 These little vanilla/vanilla cupcakes are for the team party for the Austin little league team Orange Crush. They had a great season and deserve to do some celebrating tonight! Go team! Good morning, everyone! 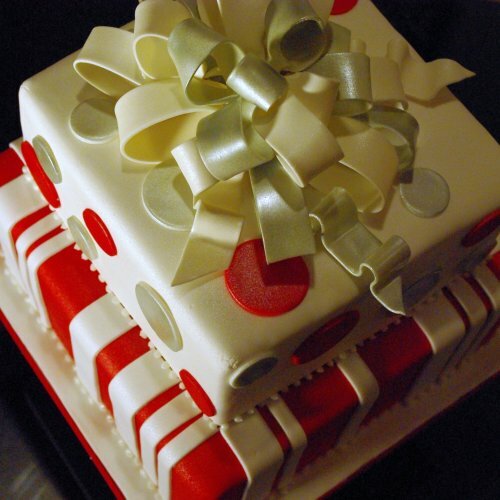 Just wanted to let you know that after months of tinkering, we’ve pushed the new Wicked Cakes website live! It has loads more content and lots of cake pics. Please check it out and let us know what you think! Also-let us know if you find any issues! 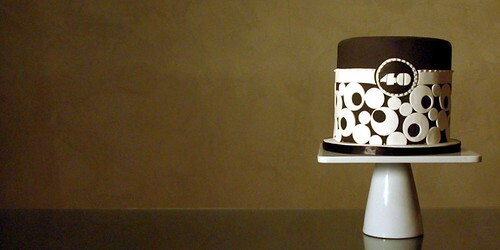 Have a fantastic Tuesday, and happy caking! New Wicked Cakes Cupcake Flavor! Snickerdoodle! Yum! 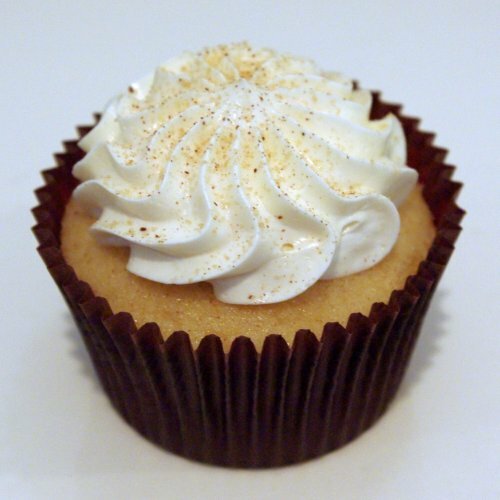 I’m adding a new cupcake flavor to the Wicked Cakes menu… Snickerdoodle! A long-time fan of the snickerdoodle, I’m so excited to add this to the official menu. The cupcake is a cinnamon-laced vanilla with Swiss meringue vanilla buttercream, topped with a sprinkling of cinnamon-sugar. Hope you all like it! 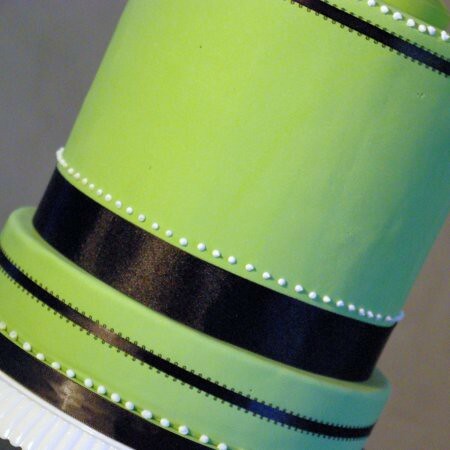 Wicked Cakes on Style Me Pretty this Week! Sorry it’s been a while!